The Four-Wheeled Rollator from Eden Mobility combines superb quality with fantastic value for money. The Four-Wheeled Rollator from Eden Mobility combines superb quality with fantastic value for money. It features either easy to operate loop brakes, which provide secure stopping and lock into place for security, or pressure brakes. A handy basket for carrying shopping and other items comes as standard and can hang under the seat or, to allow the rollator to be folded with the basket in place, can hook onto the front of the frame. A zippered pocket on the underside of the seat is ideal for keeping small items such as loose change, pens, shopping lists and so on. 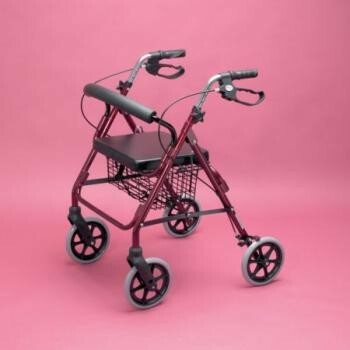 The large, swivel wheels ensure the rollator is easy to manoeuvre. The aluminium frame is lightweight but strong enough to withstand everyday wear and tear. It is available two attractive colours, Ruby and Quartz. Handle height adjustable from 765mm (30") to 875mm (341/2"). Overall width 620mm (241/4"). Seat height 530mm (203/4").